“Rabbits are brave, rabbits are brave,” Benjamin Bunny chants to himself in a wobbly voice when faced with the hungry fox, Mr. Todd, in the Nick Jr. cartoon Peter Rabbit. We watch quite a bit of Peter Rabbit in my house and Benjamin’s mantra has begun to stick with us. When my 2 year old daughter Megan has a doctor’s appointment, we’ll say, “Megans are brave! Megans are brave!” When my almost 5 year old son Alex needs to get his nails trimmed, something he still avoids at all costs, I’ll try my best to convince him with, “Alexes are brave! Alexes are brave!” It sounds silly (and grammatically incorrect), but it does help all of us get through those scary, doubtful moments. The Fantastic Flying Books of Mr. Morris Lessmore will be one of my first read alouds in writing workshop. It is an exquisite book with many reading-writing connections. The central message is that books and words can transform lives. As I read this book, there was a line that struck me: “Everyone’s story matters.” How simple and true! All of the students sitting before us have stories to share, ideas, questions, passions. Part of my job as a teacher is to help my students know that their ideas are important and worth sharing. 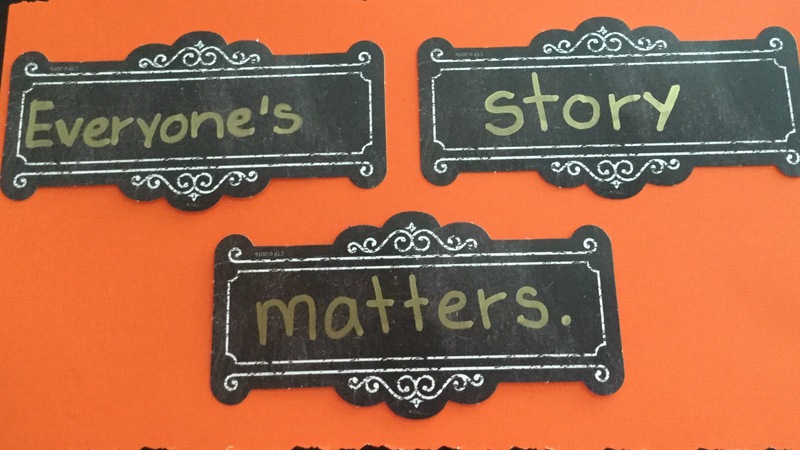 Everyone matters and everyone’s story matters. This will be one of our mantras as we become a writing community this year. We need all of the voices in our classrooms to be heard and read. I think this mantra might also help students to look at the world differently and remember that every person they meet has a story. All of our stories matter, but sometimes our stories can be challenging to write. I’m borrowing from Benjamin Bunny, but “Writers are brave” is one mantra that I want my young writers to believe and say to themselves often. It takes bravery to stare down an empty page or screen and believe that you can fill it with something worthwhile. It takes bravery to share your writing with a partner and be open to suggestions and feedback. It takes bravery to admit your writing needs work and to try again. It takes bravery to share your writing. Writers ARE brave. It isn’t easy to write and I need to remember that when I work with my students. I need to model for them the struggle, the times I got it all wrong and needed a partner to help me fix it up, the times I was so stuck or embarrassed by what I wrote. The times I said things in writing that were painful to say aloud, but were begging to be said. It takes courage and confidence to put yourself out there through your writing, but it is also a way to empower yourself, to try to make change in a world sorely needing it, and to connect with other people. What will be the words that inspire and push you and your writers forward when the going gets tough? This is brilliant! We use a mantra to keep our stamina going in writing. It comes from Lucy Calkins… When I am done I have just begun! But now I will try something else… This is a Great activity for community building in writers workshop. Last school year our mantra was: “We are tenacious”. My first graders learned a new word and how important it was to be determined and persistent when writing became challenging for them. I plan to use this mantra again this school year. Thanks for sharing this thoughtful post. Love this! It is perfect for my writers! Thank you Kathleen! I appreciate your post, Kathleen, and the way you thoughtfully presented your ideas for using mantras in your classroom. I love the way you wove all these resources together to create and enrich your mantra, Kathleen! We need to use this for launching the narrative spiral!!! I love the “Writers are Brave” mantra! And thank you for sharing the great texts. We search for our OLW and our own mantras as the year begins. Our class mantra is YOU MATTER. Can’t wait to share with the students and see what words inspire them! My personal mantra since high school is Maria’s song “I have confidence” from The Sound of Music. She sings it on her little montage journey to the Von Trapp house before meeting the family for the first time. After college, when going to job interviews I would blast this song in my car and sing along at the top of my lungs. I’m sure it released some happy chemical in my brain because I’ve walked into every interview smiling and relaxed knowing that if Maria could do anything, I could too!! Oh my goodness, I play that song while I’m driving into school on the first day!! EVERY YEAR!!!! I can’t believe someone else does this too! LOVE it!!! Beautiful post!! Thank you for the reminder!! I intend to do this and preview your suggestions! As always , thank you for the inspiration! As usual love your thinking especially since it coincides with mine. 🙂 I have used one mantra for years for myself as a teacher: Model everything, assume nothing. For my kids I have generally used Be brave and we talk about all the ways someone can be brave. Great post.